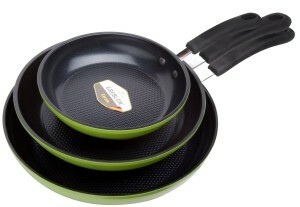 Green Earth Frying Pan 3-Piece Set by Ozeri (8″, 10″, 12″) is a Must-Buy! You are here: Home / Featured Products of the Week / Green Earth Frying Pan 3-Piece Set by Ozeri (8″, 10″, 12″) is a Must-Buy! Are you looking for a great Skillet pan set? The Green Earth Frying Pan 3-Piece Set by Ozeri (8″, 10″, 12″) is a Must-Buy! Each Ozeri pan utilizes GREBLON ceramic – an ultra-safe ceramic coating from Germany which is 100% PTFE, PFOA and APEO free (no heavy metals or chemicals). I love how durable and sturdy these pans are and they are super easy to clean. I have to admit there has been some food sticking to the pans but I find them super easy to clean by hand washing them. So, this has not been an issue for me at all. I like the sizes and these are my to-go-to pans. I like the textured bottoms of the pans and I find that if I lightly spray them with cooking spray,foods are less likely to stick. Over all, I am very pleased with these pans and highly recommend. Self Disclosure: I received a free product in exchange for an unbiased review. Photo Credit: Ozeri.